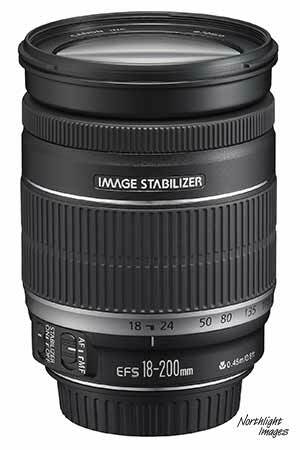 28th The Canon EF 100-400mm f/4.5-5.6L IS USM has long been a candidate for replacement. 22nd A new 400/2.8L? A shopper in a UK store finds the lens listed as discontinued [POTN] A new version should be round at the end of March/early April – updated USM mechanism and completely re-engineered IS. I’ve also seen it noted that several dealers have not had the 24-70 f/2.8 available for a few weeks. 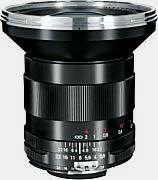 In terms of optical quality, the 24mm is most in need of revision, while the 90mm is already a very sharp lens. Quite a while ago, I was sent info about updates to the electronics in the TS-E lenses to supply the body with precise focus, tilt and shift settings info – I’ve not heard more for some time? It’s also worth noting that the EF15 fisheye lens dates from April 1987, although the current design works just fine on my 1Ds3 (and is one of the more flare resistant lenses I have). Canon used to do a 7.5mm and T/S 35mm for the old FD mount. In Germany at least, they are also offering a 50 euro discount on any lens until the end of January . EF 400 f/5.6 – IS to be added? We’ve had suggestions about the 35L , 24L and 100-400L back in September – so far the 24L has been announced. Look for the 35L and maybe some long white lenses to appear with the next 1 series camera next year. 2008 November 27th No news on any 24-105 changes. Not really a surprise, since products get ‘silent’ upgrades all the time – if it was worth mentioning then you can be sure that Canon marketing wouldn’t have lost the opportunity. 7th Quite a few relatively small price cuts now visible in UK lens prices at the moment although many are still more expensive than earlier on in the year. However I’ve not as yet seen any comparative info as to just how much or exactly what lenses have had their prices reduced? Also, there are no obvious signs of movement yet at camerapricebuster.com – not an infallible guide, but good for spotting trends. 2nd I’ve seen no sign of UK/EU lens rebates at all – anyone heard anything? 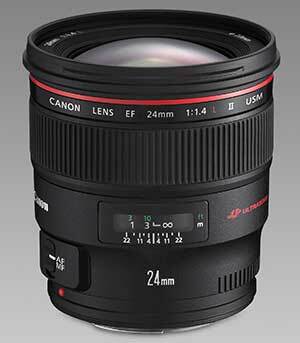 1st Is there a ‘new’ version of the EF 24-105mm f/4L IS USM lens going to be shipped with the 5DMk2? In a comment, we were told that it was a ‘silent upgrade’ i.e. not warranting being called a II version, but improved nonetheless. I guess we’ll have to wait until they start shipping and more detailed comparisons are available. There was, a short while ago, a mention of a ‘II’ version, but I’m told that this isn’t the same thing. 2008 October 20th US Lens rebates. 2nd I heard (via Calumet), that there is a new lens ‘promotion’ starting on Oct 19th – no more info, but could be part of a new rebate scheme? 17th It is a new 24L lens, but no 24-70 IS and no TSE improvements. As well as the lens, there is a new coating technology from Canon. TOKYO, September 17, 2008—Canon Inc. today announced the development of Subwavelength Structure Coating (SWC), a new coating technology for camera lenses that minimizes ghosting and flare caused by reflected light. SWC is used in Canon’s concurrently announced large-diameter, wide-angle EF24mm F/1.4L II USM lens for EOS-series SLR cameras. Reflections are caused by large changes in the refractive index of light at the glass-air boundary on the surface of a lens. To date, efforts to take advantage of light interference and minimize reflections have consisted of applying a thin film of coating onto the lens surface, but this approach can fail to provide adequate protection depending on factors like the light’s angle of incidence, and sometimes leads to ghosting and flare. Canon’s special SWC coating, a new type of anti-reflection technology, minimizes reflections by aligning countless wedge-shaped structures more minute than the wavelength of visible light on the surface of a camera lens. These wedges continuously change the refractive index of light at the glass-air boundary of the lens, thereby eliminating the boundary where the index undergoes large changes. This lack of large change in the refractive index drastically reduces reflections. SWC therefore realizes superior anti-reflective capabilities in environments where previous coating technologies could not, particularly in situations involving light with a large angle of incidence. Utilizing SWC technology on large-curvature lens elements, which are mainly found in wide-angle lenses, will significantly minimize the occurrence of ghosting and flare caused by reflected light in environments that have posed problems in the past. Canon will offer high-performance lenses that deliver excellent image quality by actively incorporating SWC technology in future lenses, especially those containing large-curvature lens elements. Reflections off a digital camera’s image sensor can compromise images with ghosting and flare. To help reduce this, the inside of EF 24mm f/1.4L II USM’s front element is treated with Canon’s new Sub Wavelength structure Coating. Developed specifically to work with Canon optics, this anti-reflective coating helps reduce flare and ghosting – for consistently crisp, undistorted images. 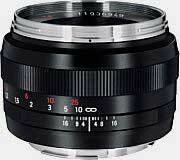 September 15th As expected, we have Zeiss lenses with EF fit on the way. All lenses are manual focus but chipped, meaning that lens data will be transferred and auto exposure is possible, as well as electronic focus confirmation. 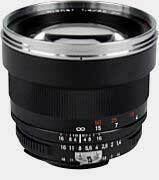 First available (end of 2008) is the 50mm and 85mm, followed by the 21mm (in 2009). reduzierter Bildkreis ? ? ? Größter Abbildungsmaßstab 1:5 k. A. k. A.
optische Bildstabilisation ? ? ? Anzahl Blendenlamellen ? ? ? Filterdurchmesser M82 x 0,75 k. A. k. A.
Abmessungen (Durchmesser x Länge in mm) 87 x 109 k. A. k. A.
Zubehör serienmäßig Störlichtblende k. A. k. A. Is this the new 35mm? 11th Plenty of speculation on whether the lens on the camera in the Canon teaser ad is a new one. At DPR people have done some measurements. The small dot in the lens also suggests a wide lens. 5th The extra lens capacity we mentioned a few days ago is coming partly from a new Canon lens manufacturing site. 2008 September 3rd Lots of lens info is included in a big chunk of info we’ve received today. Competitive consumer grade EF-S lenses with IS – the release of the 18-200 IS after last year’s 18-55 and 55-250 are felt to provide good coverage in the XXXD and entry XXD markets. Upgrading IS in all lenses to current 4 stop designs while they do the lenses. Canon have upped their new lens design capability from 2 to 3 a year (this is significant in the amount of resources required) and are looking at 4 as a peak over the next few years. Canon has answered the call from advanced amateur photographers looking for a solid all-around lens with the introduction of the new EF-S 18-200mm f/3.5-5.6 IS zoom lens. With an incredible focal length range equivalent to 29-320mm in the 35mm format, the new EF-S 18-200mm lens will make an excellent addition to any camera bag, and it gives shooters a great lens to capture both standard as well as telephoto images. The new lens features Canon’s built in Optical Image Stabilization system which gives the equivalent effect of a shutter speed roughly 4 steps faster, for better image clarity, even in shaky shooting conditions. With a minimum focusing distance of 0.45m/1.5 ft. at all zoom settings, this new lens should prove to be ideal for those situations where swapping lenses isn’t an option. 2008 July 24th Expect an 18-200 for the 50D. 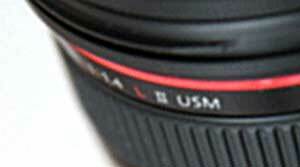 particularly since the latest leaked Chinese Canon site has a photo of the 50D with an 18-200 on it. No larger images than this one at the moment. 22nd While there are lots of comments about an 18-200 for the 50D, there isn’t any real word of anything else that we might expect to see with a 5D replecement. 50MP sensors will benefit from good glass… To put it into context though, it’s about 8660×5770 pixels, compared to 5616×3744 for my 1Ds3 and 4064×2704 for my old 1Ds. Thus a 50MP sensor gives a pixel spacing of 240/mm compared to 156/mm for the Mk3. 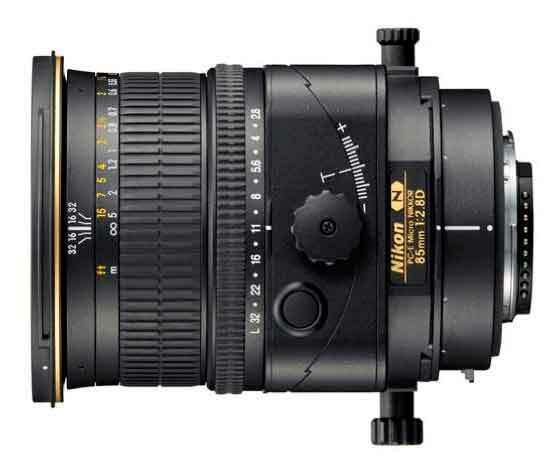 From the Xitek forum a menttion of new lenses that include an IS 100mm macro and a 35-70 F2. 17th Thanks to everyone who pointed out that the 24-105 was actually in an ‘Image Stabilised’ section. I didn’t think that such a new lens would be replaced, but I’d certainly agree with those who’d like a faster IS lens. 16th I just had it pointed out to me (thanks) that the Canon UK site has dropped the EF 24-105mm f/4L IS USM from its lens line up. It’s still there on the Canon US and Japan sites. A further check shows that it’s gone from other EU sites too. Also on this Dutch site. Since this is a Canon lens page ;-) I’ll move all the new tilt/shift lens info to the Nikon 45mm PC-E and Nikon 85mm PC-E pages later. I’ve had several more comments that Canon will be responding to these later in the year. “Nikon dévoile deux nouveaux objectifs à décentrement, les PC-E Micro Nikkor 45 mm f/2,8D ED (2000 euros) et PC-E Micro Nikkor 85 mm f/2,8D (1849 euros). 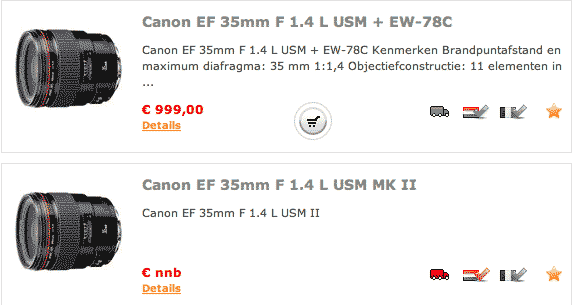 28th It looks as if Canon is going to be bringing out an EF-S 18-200mm F 3.5-6.6 IS for September (original site says 6.6 … maybe a typo for 5.6?). This fits in with what other manufacturers have produced and obviously suggests that this size of lens will sell. 19th The other shift lens is supposedly an 85mm PC (T/S) lens. This lot is supposed to appear on July the first [DPR] with two bodies. 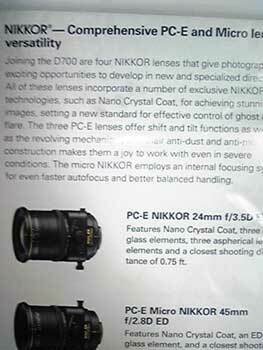 18th In the middle of a big D700 ‘leak’ (see 5d2 page) there was a mention of new Nikon lenses. Including 2 new T/S ones. The below picture shows a 45mm along with the current 24mm. 13th Are dealers being told to wind down 24-70 2.8L stocks? [CR] – no real info on this one, and no comment from many of our rumour section ‘dealer friends’ ;-) A new ef24-70 2.8L IS ? 11th In another ‘dealer comment’ we were told of ‘at least one’ tilt/shift lens in the new lens announcements later this year. Unfortunately whether it was wide or long wasn’t known. 3rd I’ve been hearing various reports of shortages of the 400mm f/5.6 L.
2008 May 26th Is a new version of the 24-105 on the way? I was sent details (thanks for the translation!) of a Xitec (Chinese) post which suggests a sighting of the new lens. “As reported by a Chinese living in USA in China’s biggest photography forum, a new 24-105 is probably around the corner! In his post, he said he was playing sports with his friend in Orange Country, South California. He saw a photographer taking photos of the court. He went to the photographer and saw ’24-105 II’ on the lens. 11th The US ‘instant’ rebate scheme will run from May 18th to July 19th. No firm rebate info for the US yet, but a post on FM suggests that the ‘instant rebates’ will include at least the following. 6th from Germany we’ve had a report (thanks) of a major dealer suggesting a prospective purchaser of a TS-E24mm wait and see what Canon announce in June… “more than just 1 TS-E lens to be announced soon” they also seemed quite keen to suggest June rather than an announcement for Photokina. April 30th At FM there’s a post suggesting June for the next Canon lenses (2 off). As well as the (long) expected 5D2 there is a 1DMk3n. 2008 March 23rd The 5D firmware update adds extra lens correction functionality. That said, if you include the 200 and 800 that Canon showed at PMA then I’m expecting quite a few Canon lenses this year. I’ve now had several comments all suggesting that new tilt/shift glass is amongst these, although whether this was in the form of updates or whole new lenses, no-one was sure. March 8th I’ve used DxO optics Pro quite a bit in the past and while I’m waiting for it to catch up with the fact I’m a Mac user with a 1Ds3, I’ve been trying out some of the lens correction options in Canon’s DPP software. BTW, I’ll have a report of using the latest DxO with the 1Ds3 as soon as I can. *1 Lens aberration correction functions cannot be used for the image taken with the combination of the lenses *1 and EOS 5D camera, since it is incompatible. *2 Lens aberration correction functions cannot be used for the image taken with the combination of the lenses *2 and EOS 5D camera whose firmware version is 1.0.5 or older, since it is incompatible. *3 Lens aberration correction functions cannot be used for the image taken with the combination of the lenses *3 and EOS 30D camera, since it is incompatible. *4 Lens aberration correction functions cannot be used for the image taken with the combination of the lenses *4 and EOS 30D camera whose firmware version is 1.0.4 or older, since it is incompatible. I did have a quick go with the Nikon PC-E Nikkor 24mm f/3.5D ED on a D3. Slightly lighter than the Canon lens, but otherwise very similar. February 16th Canon Europe are having another round of rebates (5D/40D/400D and lenses) it starts on March 1st and runs to the end of June – details on the 5D2 page. 5th Looking for an EF 1200mm F/5.6? B&H have a page if you want to buy one. January 29th The lenses were for real… given my interest in T/S lenses I’m putting all the Nikon PC-E Nikkor 24mm f/3.5D ED info on a page of its own. Note you get another 0.5mm of shift and 0.5 degree of tilt compared with the Canon version. 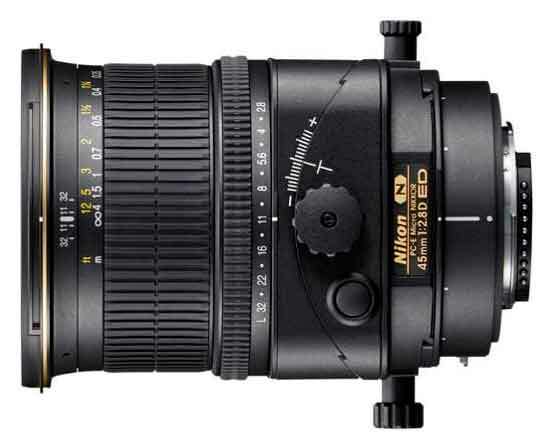 If the 24mm is as good as some of Nikon’s recent wide lenses then I suspect that unless Canon do update the TS-E 24mm, then I’ll be looking for a Nikon lens adapter. The current TS-E is manual focus so not a lot would be lost with a good adapter. 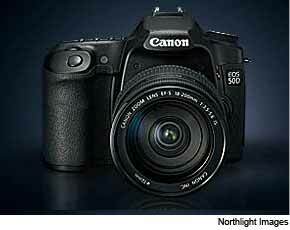 Of course I’m still hoping that what I heard last year about Canon updating the TS-E range turns out to be true. I was using the TS-E 24 on my 1Ds3 this afternoon on a job and I could do with a bit sharper detail at a lot of shift. Out of curiosity, it was also the first time that I’d used liveview in a busy factory environment where getting to the eyepeice was not easy. January 25th I’ve seen and been sent a number of ‘dealer related’ mentions of new tilt/shift lenses (such as this brief one suggesting June 08 on flkr and mention here on 12th Oct and 26th Nov). Unfortunately dealers are rarely given much advance notice by Canon, and when they are it’s usually to senior management under NDA. One thing I’d be curious about is just how many T/S lenses Canon sell? They used to be very small volume sellers, but I’ve seen far more discussion and use for them over the last few years. LAKE SUCCESS, N.Y., January 23, 2008 – Canon U.S.A., Inc., a leader in digital imaging, today announced the launch of two new telephoto lenses for use with its EOS SLR cameras: the EF200mm f/2L IS USM and the EF800mm f/5.6L IS USM, the world’s longest focal length lens with an Optical Image Stabilizer system. The Company, which exhibited prototypes of the lenses during PhotoPlus Expo in New York last October, is launching them at the PMA tradeshow (booth E101) at the Las Vegas Convention Center, January 31 to February 2. MFD is 1.9m with the limiter at 3.5m. Weight feels signifcantly less than the 200/1.8, say a little lighter than the 300/2.8 IS – but not much. It comes in the same lens trunk as the 300/2.8 IS, and is quite a bit smaller than the 300/2.8 IS – certainly much smaller than the 200/1.8. Which brings me to the biggest drawcard – the handling. The compact nature and the balance on the 1D Mark III is a huge improvement over the 200/1.8. The slight loss in lens-speed certainly is relatively painless (to me) when one considers how much the handling has improved with the 200/2 IS. Speaking of IS, it feels a little improved over the other super-teles – but didn’t ‘feel’ like it was 4-stops worth based on my brief test. Price: I got the feeling it will be a little less than the 300/2.8 IS in the Aus market. Which puts it at about AUD8k RRP. The Canon lens rebate (US) was supposed to end on the 13th?